7 months ago, I began a makeup and nail online course and I have loved every minute! At times, the amount on information I had to consume was slightly overwhelming but when it’s something you love, it doesn’t feel like a chore. In fact, I was almost dreading the end as I knew I couldn’t read all about something fun followed by provided relating video material anymore. Be warned, it may say the course takes a certain number of hours however this is just reading time (minus the videos). To actually learn the information took me many months. At the end, there was an exam with a 60% pass mark-I passed!- and then you can get a certificate to prove your work. On the course there was so many amazing topics from how to give a manicure to what colour eyeshadow works best for each eye colour. I loved how the material was presented with pictures and an almost blog style format. I also loved how there was a skin care topic (approx 8 hours reading time) that went really in-depth into the skins biology as well as how to treat your skin based on its type and how to get nutrients from foods that support different aspects of skin health. The skin topic was by far the hardest with the intense amount of information and, what seems at first, the alien terminology. Examples are emollient, beta carotene, argireline, humectants. To aid my learning I put a full face on 4 people: young to mature, all with different skin needs and colourings. I also made a portfolio to give me more opportunities once I had finished. The course was not too expensive but well worth every penny, in my opinion: It was educational, interesting and had me looking forward for the next topic every time I went on the website. I’d really recommend taking a makeup course online if you have a busy lifestyle or just wasn’t a creative escape from some hardhitting A levels. The bonus of a student discount card also added to the many pros of my experience. If you’re thinking about doing a makeup course, go for it! I’m sure you won’t regret it. Too faced’s stunning ‘white peach’ palette is full of muted peach and pink tones with mesmerising duochrome shades that compliment each other perfectly. Buildable, smooth shades apply easily and blend well however, there is some fallout – but nothing crazy. With Medium pigment, the formula seems different to other Too Faced palettes (really pigmented) however this is not at all a bad thing, I really like it. A natural blend of warm shades can create a subtle yet beautiful eye look for everyday wear. Alternatively, the gorgeous, deep black, purple and blue duo chrome shade in the bottom corner would be perfect for a more smokey eye. Versatility is really shown in this product with many different possible looks from a range of shades that all work so well together. The packaging is so pretty, I love the vintage feel of the faux peach clasp paired with the fun ombré colour on the top. Another pro is the huge mirror that covers the entire lid of the medium sized palette. The packaging feels luxurious and the product inside is just as good. I love this palette and really recommend it. Lately, there has been a ton of natural makeup inspiration from the recent royal wedding. Having always felt not pretty enough to use makeup to enhance over recreate, it was so nice to find that, actually, natural makeup can look really flattering too. Below is a list of how to/products perfect for achieving a gorgeous, natural face. Shimmer as a primer- whether it be something like Mac strobe cream, pearly porefeshional or simply a shimmery cream bronzer, apply shimmer as a primer (on top of a well prepped face) to get the natural glow seen all the time in this sort of makeup. Nars sheer glow- apply this low coverage foundation sparingly with a brush to allow your skin to look like skin (not a mask). Use extra foundation to cover imperfections as concealer can easily look too cakey. Cream contour- I know this is supposed to be natural but just trust me. Cream contour can be pushed into the skin, blending very easily to look more part of the skin rather than put on. I love the zoeva kit for the mix of warm, cool, banana and shimmery creams. Take some product and push it into th skin to best enhance your facial structure. I like to have my contour sit high to lift my cheek bones slightly. Blush and Highlight- what is lost in natural makeup should be made up by creating a youthful healthy glow with blush and highlight. 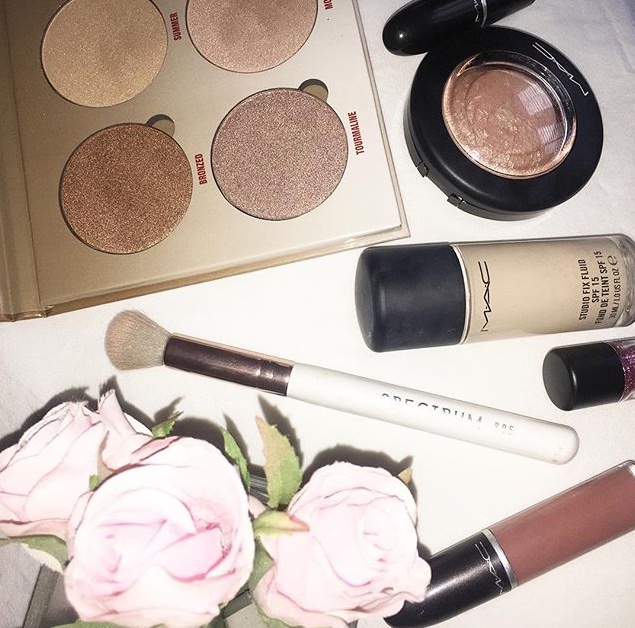 My natural favourites are collections shimmery blush and Macs soft and gentle. Glowing skin is such a must for this makeup style and blush makes you look healthier and fuller in the cheeks. Eyeshadow- taking what is left of the cream contour on your beauty blender, place onto the eyelids to cover any darkness/redness/veins and to deepen the eyes and make them stand out a little more. Loosely set with a dusting of powder to avoid creasing. Mascara- Add a lengthening mascara not prone to clumping, I love the roller lash for this as it leaves lashes so fluttery. Dior lipgloss- lipgloss is my new obsession especially by Dior and for natural makeup. Choose a colour that enhances your skin tone, usually a shade within your lip tone a few shades either side of the actual colour.